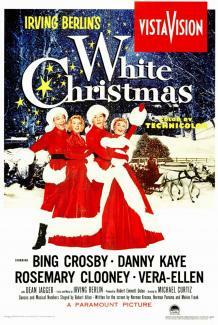 If ever there was a song for a festive film, it is Irving Berlin's White Christmas, one of the centrepiece songs of the musical comedy film of 1954. The song had been around more than a decade before the film, sung first by Bing Crosby on Christmas Day 1941 on his weekly NBC radio programme The Kraft Music Hall. His version went on to sell more than 100 million copies. The film, starring Crosby, retains popular affection as a nostalgic festive treat and it is a good musical with a lot of star power. The plot, directed by Michael Curtiz, is thin but warm-hearted. Crosby and Kaye (as Bob Wallace and Phil Davis, a top song-and-dance act) play former soldiers who take a vacation in Vermont with a pair of entertainers played by Vera-Ellen and Rosemary Clooney. They arrive at a struggling country pub run by their former World War Two commanding officer, Dean Jagger. They put on a show to save his business. Cue a great production and sparkling versions of some Berlin classics, including Love, You Didn't Do Right By Me, Count Your Blessings Instead of Sheep, The Best Things Happen While You're Dancing and, of course, White Christmas. Munch a mince pie, raise a glass and tap your feet warmly.